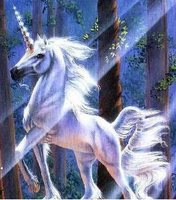 The double doors to the emergency room flew open, and there appeared a magnificent unicorn, a stethoscope bouncing against its snowy chest, its flowing mane glowing like silken alabaster in the burst of ethereal light accompanying its grand entrée. The nurses stepped aside as the unicorn pranced to the operating table, where a young man lay clutching his bleeding and horribly misshapen head. The gorgeous creature gently nuzzled the patient’s cheek. Its warm equine breath smelled of sweet alfalfa and enchanted forests, and soon the man stopped moaning and writhing. Then the unicorn plunged its mighty ivory horn deep into the man’s chest cavity, and when the creature raised its head, a throbbing pancreas was impaled on the tip of its gore-smeared shaft. The nurses clapped and wiped tears from their eyes, and the unicorn whinnied and neighed and stamped its hooves excitedly. Then, after nibbling on a gift of carrots and sugar cubes, it galloped away beneath a sparkly rainbow, to a magical land where malpractice suits don't exist.